SuperMassive Games was a studio that put themselves on the map with Until Dawn, a choose your own adventure title with a few celebrity-faced teens trapped on a mountain with a deranged killer. It was an extremely fun game that saw the studio create a few spin-offs and even another choice based adventure in Hidden Agenda. Recently, SuperMassive Games have been on the VR kick, releasing Until Dawn: Rush of Blood, which is still one of the best VR titles available for the platform, The Inpatient, which was pretty terrible, and now Bravo Team, which sadly is even worse. 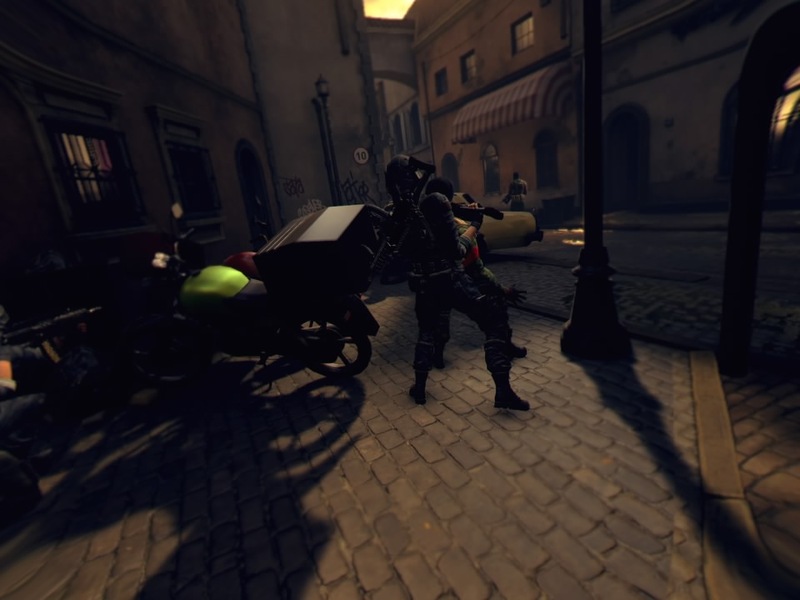 Bravo Team was heavily talked about to be the next big VR shooter, but instead, feels like an asset flip copy and pasted generic shooter with no redeemable qualities. To say there is even one good aspect of this game is to just offer fake praise. The game in many ways falls flat by offering no tense action or spectacle as if someone made an entire game around the humdrum moments of a Call of Duty campaign mission. This is to say nothing of the uninteresting environments littered with as much story as you can write on a mini post-it note. Bravo Team isn't the worst VR game I've played, but it's one that should have been great. The entire story of Bravo Team is attempting to get back a foreign dignitary, some fictional European President who is captured in the first few minutes. That's it. There is no getting to know who your character is or some kidnapper's ransom story, it really just is that cut and dry. They attempt to add in some narrative to the whole event in the last 5 minutes of the game, but by then, it's just too little too late. You do have a voice in your ear telling you about enemy forces or snipers that all around you, but most of that chatter is relative to your surroundings than of the narrative itself. Bravo Team gives you a variety of control methods, but sadly, none of them feel solid. There's the Aim Controller that made its debut with Farpoint, and frankly, that controller worked wonders for that game. For Bravo Team, it's a hysterical mess. Holding the plastic gun is fine, but trying to have it sync up with your on-screen movements is a chore. I would hold the controller up straight in front of my face like I was aiming down sights, but it would be off center and I would need to turn the controller far more to one side to line up a straight shot. This is even worse when attempting to snipe, an action that requires you to look directly into a pixelated scope, devoid of any detail what-so-ever. I never once felt that the Aim Controller properly lined up my movements in-game yet I never once had that problem with Farpoint or any other VR game that is compatible with Sony's shooter peripheral. You can use the Dual Shock Controller or a set of Move wands, but frankly, as bad as the Aim Controller is, it's still the better way to play. 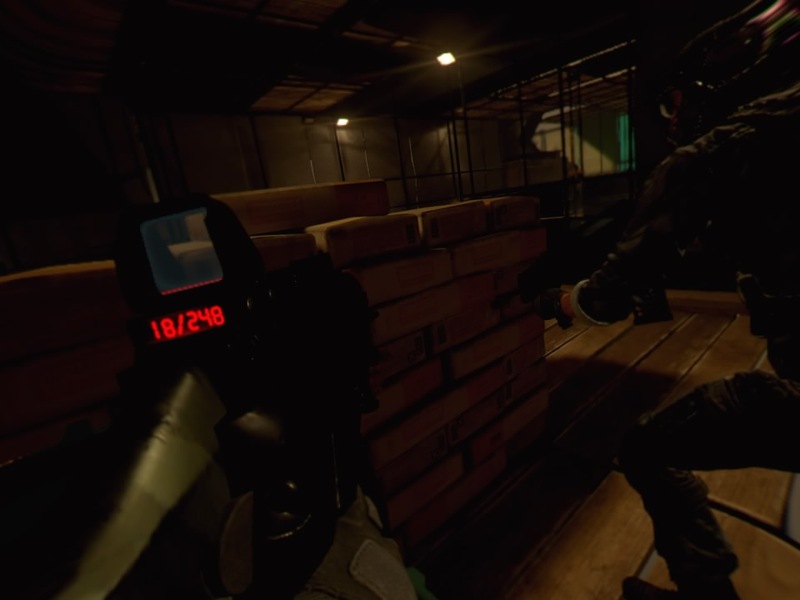 Supermassive Games attempts to alleviate the motion sickness feeling that can come from most VR games by having your movements tied to an external camera showing your character move from point to point. You will control a stationary character in a first-person VR space and click a button on the controller to then move to the next bit of cover. Instead of teleporting like in Doom VFR, which is a fantastic game by-the-way, you have these awkward running and jumping animations that often have your character clipping through the level. 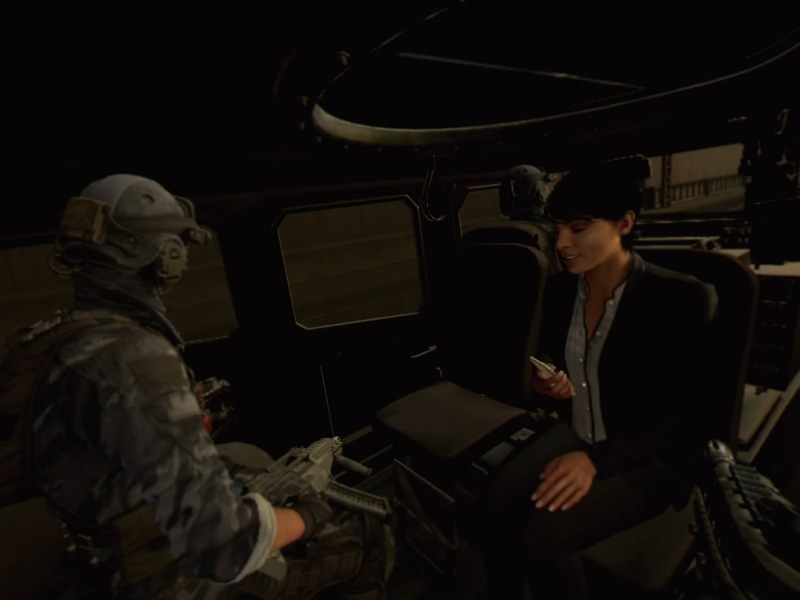 The motion capture in this game is painful and you never feel as if these characters are part of the armed forces. The snap cover locations can often be finicky to target and it's easy to accidentally move the camera and select a spot that leaves you out and exposed. I've also had my AI character block the only path that lets you jump from roof to roof and while there are cover locations that are easy to spot, there are some that don't allow cover that just doesn't make sense. The AI featured here is probably the worst I have seen in years. Enemies will constantly run past you, around you, and even stand right next to you and just sit there. I've had my AI teammate run all over the place while my character is downed and waiting for rescue, only to show up, stand in front of me and keep on fighting. I've had enemies run around the room and through doorways like I was watching an episode of Scooby Doo. Enemies will enter through doorways and other spawn locations and just keep coming until you press forward, usually following the exact same paths and hiding behind the exact same sets of cover as every soldier before them. While there are some fair sized locations, the AI will only use certain bits of cover and usually remaining in one location will allow you to reach every single one of them. Much of Bravo Team takes place in the typical environments you expect from the type of story it fails to tell. You have a bridge, a police station, an office building, a courtyard, city streets and alleys, rooftops, and an embassy. Nearly every location is just the same textures or rooms copied and pasted and this is even more apparent when taking on forces via the rooftops as every room on every building is one of three different backgrounds, as you can see in the above picture. There is nothing here to impress or even acknowledge as acceptable. Character models are lacking any decent detail and it took half the game before I even saw any variety in the enemy forces I was gunning down. It was also half the game before I was given the option to use different weapons than what I started with. While it's possible I just missed these weapon caches you eventually come across, it was a solid hour before I was able to change up my loadout. The shotgun was better for the smaller environments, and given that 70% of the game is in small enclosed locations, it is easily the best gun in the game. You do get a sniper rifle, but given the horrible pixelation to the scope, I usually just sniped the snipers with my handgun as it was clearly more efficient to do so. Regardless of any weapon type, you never feel the impact of your shots. There is no satisfying crunch of a well-placed headshot or anything that punctuates a kill. The kills feel as tangible as a lightgun shooter in the arcade, all flash, no feeling. You can play with another online co-op partner and I'm still hoping for the day we can have one player on the headset and another player on the tv playing together, but until then, online co-op does function here but it took multiple attempts to even find people playing this game. You can play the campaign or a score attack mode, but that's about it. I do recommend playing this with another player as the AI partner is the worst I've seen since Resident Evil 5. Supermassive Games has talked up Bravo Team about its unique snap-to cover-based mechanic and its co-op focused gameplay, but I just don't see a game here worth the praise. Bravo Team can be completed in well under 3-hours and just doesn't offer the type of content that screams replayability. The game is a lot more enjoyable when you are playing with someone, but frankly, myself and my teammate mostly talked about how ugly the game was and how dumb the AI is. If you are looking for a Call of Duty type VR experience, this is not it by any stretch of the imagination. This is not the next big thing in VR, it's rather a title that should be avoided at all costs. bravo team WAS PURCHASED BY THE REVIEWER.